and I have to say I was thoroughly impressed by how great of a children's book this is. Like many of the bullying books I have come across it takes place in the under water world of sea life(I guess they have a bad bullying problem too!) 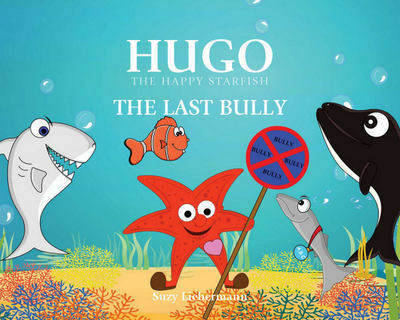 the star fish runs into his friend Clooney Clownfish who was sad and crying as Bandit the Barracuda followed behind him teasing him about his looks. Hugo made sure to stand up for his friend Clooney and make sure he was aware that he was normal he spoke with Bandit but it did no good and he went off to bully more. Throughout the book fish after fish get bullied and their size grows and grows. Hugo does not give up! He takes a stand bully after bully forming the A.B.C. (Anti Bullying Club of course) and in the en the prevail the whole ocean bonds together to be friends and bullying is extinguished! I really loved the message in this book. I love how it also throws in the Spanish translation of several phrases encouraging diversity. As an educator I see tons of bullying in schools and I intend on sharing it with my students! 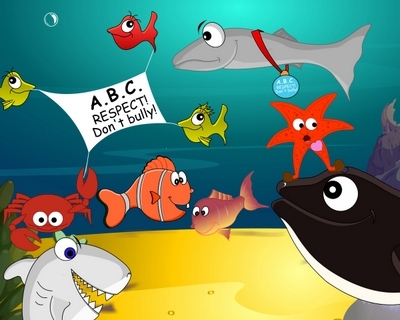 It is never to young to teach your children to respect other rather then be the bully. Preventing bullies starts at home be part of the solution and not the problem! In late February This book will be available in 7 different languages on amazon.com so if your children feel more comfortable learning in another language make sure to check out the ebook version. This looks like a great book. I'll have to recommend to our school for purchase. My girls are always telling me about "clubs" they have on the playground. This is one I'd LOVE to hear about! I think this looks like a wonderful resource. Bullying is such a serious problem these days. This looks like a valuable book! This book sounds like a great resource. My kids are focusing on some anti-bullying stuff in school this month. I will have to find this for my daughter to take in with her.